1-19 LARCHMONT 1 MICHAEL KELLY The Marietta Times Larchmont House at 524 Second St. looks down a slope verdant even in winter. The house, commissioned by Albigence W. Putnam in the 1830s, was never occupied by the owner. Larchmont House looks down from a height on Second Street. Now more crowded by its neighbors than when it was built 180 years ago, it still seems aloof, screened from the street by a black iron fence and twin cypress trees, broad stone steps leading between the trees up the slope to the elegant pillared entry. MICHAEL KELLY The Marietta Times Lighting fixtures on the main floor of Larchmont House were acquired from various parts of the country and are restored period pieces. 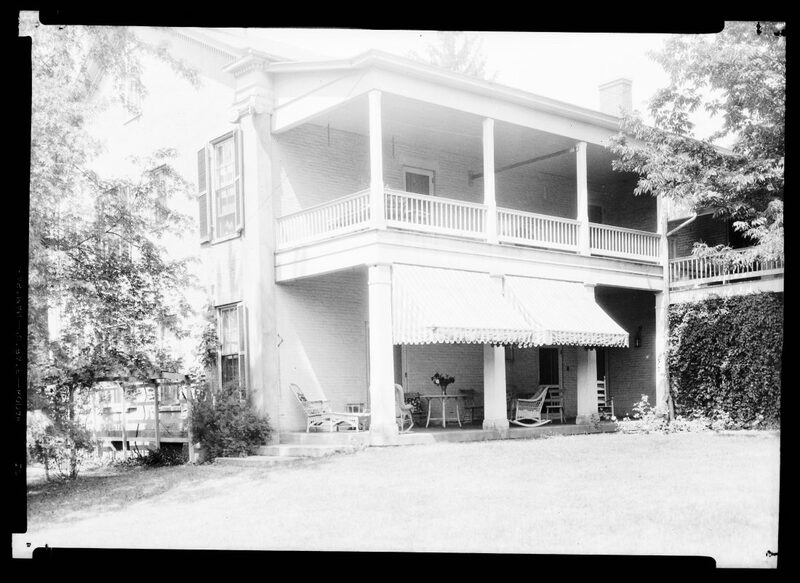 Courtesy of Marietta College Special Collections (Harry Philip Fischer) An undated photo from the early 20th century shows the back of Larchmont House, including porches and what originally was servants’ quarters. 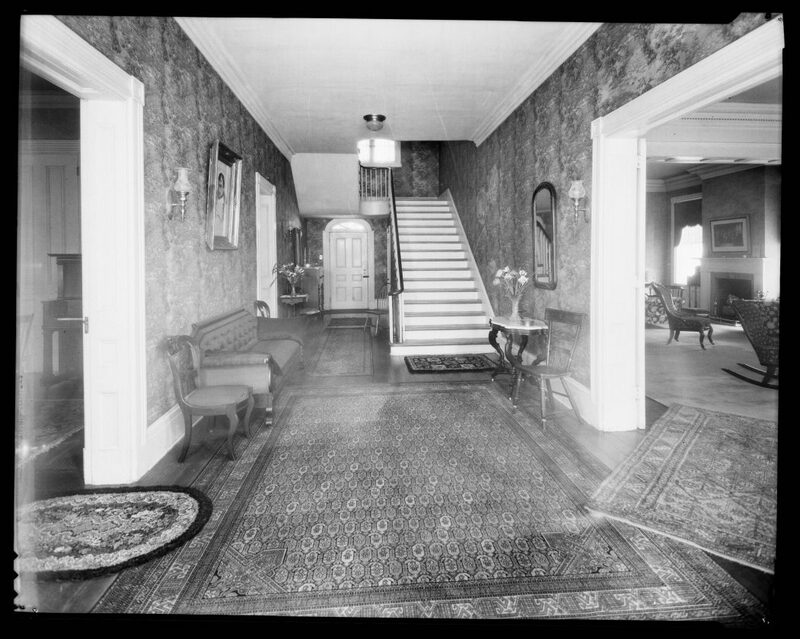 Courtesy of Marietta College Special Collections The entry hall in Larchmont House is shown in this undated photo taken in the first half of the 20th century. 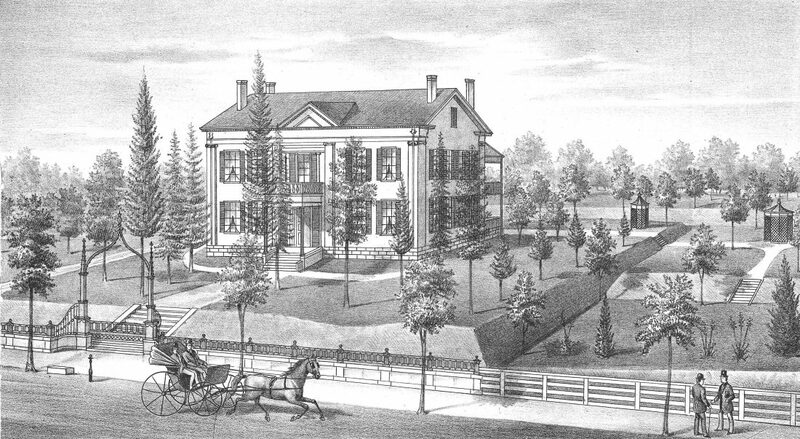 Courtesy of Marietta College Special Collections A drawing of Larchmont House, somewhat stylized, was published in a local atlas in 1875.
was built, Martin Van Buren was president, Andrew Jackson was still alive and the Civil War was more than two decades in the future. The nation was about to suffer from a currency crisis that would last more than five years. Albigence Waldo Putnam, a member of one of Marietta’s most prominent families, commissioned the building of Larchmont with the apparent intent to move back to Marietta with his southern bride. Putnam had studied law in Ohio and moved to Mississippi to work for an uncle, eventually becoming a successful banker, involved mainly in debt collection. Putnam married Catherine Sevier, granddaughter of John Sevier, the first governor of Tennessee, in 1825 and settled near Nashville. Catherine died in 1834, and Putnam then married her younger sister, Cornelia. 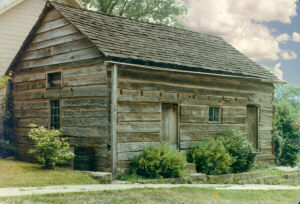 It is said he built Larchmont for her with the intent of returning to Marietta, but the couple remained in Tennessee. Putnam bought a manorial home south of Nashville, said to be similar to Larchmont, called Waverly Place. Cornelia died in 1845, and Putnam stayed in Tennessee, ultimately becoming a founder of the Tennessee Historical Society and well-known for his historical writings. He died in 1869, just over 10 years after the death of his third wife, Mary. It is probable Putnam never set foot in the magnificent house he commissioned in Marietta. Property records show a value of $20,000 for Larchmont in 1838, a fortune at the time, the approximate equivalent of half a million dollars today. The house was transferred to a group of Marietta residents — Owen Franks, Felix Regnier and George W. Barker –in 1850 for $8,000, and served for several years as St. John’s Female School operated by the Episcopal Church. The Owen Franks family apparently took occupancy of the house afterward and lived there until 1911, or least had ownership of the house. Franks was a prominent businessman, operating a foundry and riverboats. In 1911 Larchmont was transferred to the board of education, apparently the result of an auction sale to satisfy a debt. It may have been used by the board as a school for several years, and was sold to William Cram in 1919 and remained in that family for decades. Property records through the 1940s and 1950s could not be located, however the Washington County Auditor records show that Benjamin H. Putnam, Jr., and Mary H. Putnam owned the house in 1961, and transferred it to John and Mary Alice Oxaal in 1967. The Rosenblum family acquired it in 1968 and lived there until 1984. Alex Schwandel bought it in 1984 and sold it to Janet Gram in 1992. The house is now occupied by David Dernberger and Geoffrey Coward, who have spent years restoring Larchmont to a semblance of its original Greek Revival-Federalist architecture and design, and modernizing and repairing its infrastructure. They bought Larchmont in 2005. “We had been looking at houses, and what drew us was the ceiling height and the spacious rooms, the symmetry,” said Dernberger, who grew up in Parkersburg and Marietta. Although the house has been through many owners, and for brief periods was repurposed, the primary structure was intact, he said. “In that sense, it wasn’t a lot of work,” Coward said. For several years after the purchase, Dernberger and Coward lived and worked away from the area, and during that time most of the infrastructure work — new heating and air conditioning systems, extensively reworked wiring and plumbing — went ahead while Dernberger’s mother, Barbara, lived in the house and helped coordinate the projects. 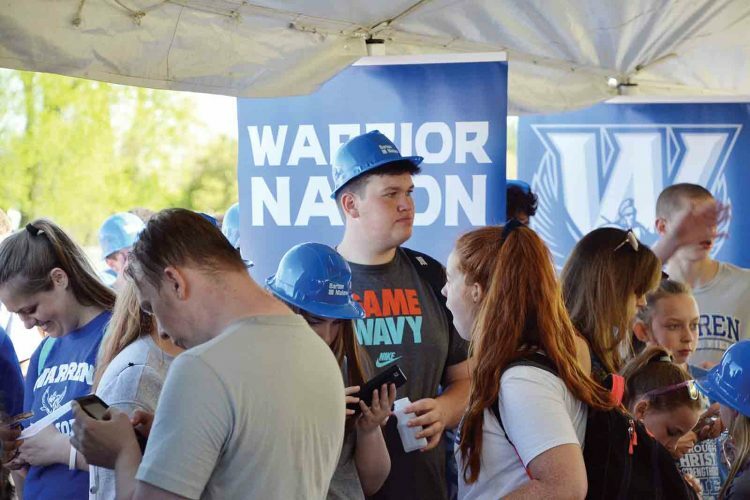 The decorative side of restoration was a slow and deliberate process, Dernberger said. “We focused on the builders’ diaries,” he said. The building was overseen by Col. Augustus Stone, whose other prominent project was Maple Shade, originally built in Belpre but later moved across the river to Blennerhassett Island. The house is nearly identical in floorplan to the Stephenson House in Parkersburg, he said, and others similar to it can be found in the south. Courtesy of Marietta College Special Collections (Harry Philip Fischer) An undated photo from the early 20th century shows the back of Larchmont House, including porches and what originally was servants' quarters. The two searched far and wide for period-appropriate fixtures and furnishings. 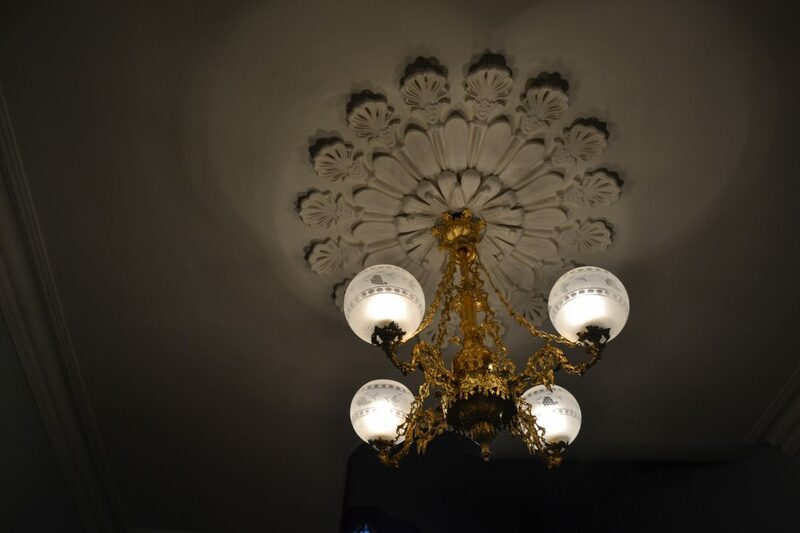 A chandelier in the living room came from New Orleans and was restored and wired by an artisan in New York. Originally an oil lamp, the light includes a vessel high in the center for whale oil, which at that time was sold by the barrel. The entry hall is paved with marble tiles. Dernberger said he saw a house of similar construction from the same era in Savannah, which had marble flooring from Georgia, and he custom-ordered Georgian marble, although he had to obtain it through Canada. The parlor spans the entire south side of the house, with a pair of wood columns flanking the halfway point. Derberger said they match the pillars on the porch and add some support to the ceiling span. All the rooms are symmetrical, elegant and bright, with 14-foot ceilings and massive windows allowing floods of natural light even on dim winter days. A mahogany staircase rises out of the entry, ascending through several landings to the third floor. Most of the restoration work on the 6,000-square-foot house, Dernberger said, was done by local artisans. Joshua Rosenblum, now 55 and a prominent Broadway composer, conductor and pianist living in New York City, grew up in Larchmont, which his family owned from 1968 to 1984. Rosenblum said he remembers a type of open-door existence, with many friends coming and going. Rosenblum said his was one of the few Jewish families in the city at that time. 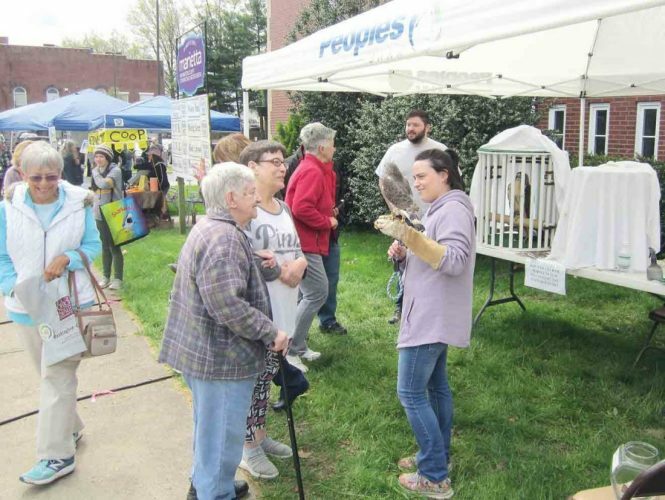 “On Rosh Hashana, we would host the Jewish kids from Marietta College, 30 or 40 of them at a time,” he said. His mother, he said, was an art historian, and one of his brothers became an architectural historian, a career choice that he thinks might have been influenced by growing up in Larchmont. 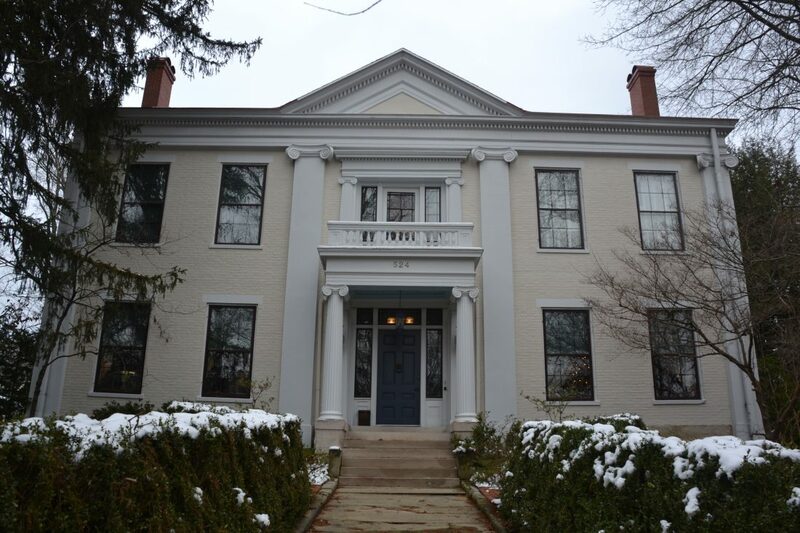 Both Dernberger and Rosemblum are dismissive of local legends that the house served as a stop on the Underground Railroad and at one time was connected to a landing on the Muskingum River by a tunnel. Larchmont gets a full page in Jann Adams’ book “Behind the Doors of Historic Marietta.” She points out that Nancy Hollister, who became the first female mayor of Marietta and later the first female governor of Ohio, was the daughter of Benjamin and Mary Putnam, born in 1949, and grew up in the house during the 1950s and 1960s. Hollister had a lengthy political career, serving in appointed offices and elected Lieutenant Governor in 1994. She served 11 days as governor after George Voinovich had to vacate the position on his way to being a senator. Hollister went on to take the 93rd District seat in the Ohio House of Representatives for five years. Hollister, according to Adams, said the house had a romantic charm. • 1801 – 99-year lease to William R. Putnam from Ministerial Trustees. • 1830 – Elizabeth Evans et al to Edwin Burlingame, two-thirds of the lots for $200; one-third retained by Jane M. Burlingame. • 1834 – Edwin and Jane Burlingame to Daniel Boomer. • 1834 – Daniel Boomer to George Dunlevy. • 1838 – George Dunlevy to Aaron (deed later corrected to Albigence) W. Putnam, $4,500 (note: Putnam paid $20,000 to have the house built on the lot). • 1851 – A. W. Putnam to C. Franke, Felix Regnier and George W. Barker, $8,000. • 1856 – George Barker and Felix Regnier to Owen Franks, $3,000. • 1882 – Owen Franks to Catherine Franks, $3,500. • 1911 – Catherine Franks et al to Sheriff, board of education, city of Marietta, $13,000, including recovery of $7,714.44 for a note held by Samuel H. Putnam, Jr.
•1919 – Board of Education to William J. Cram, $16,000. • 1936 – Owned by Mrs. Emma Cram. 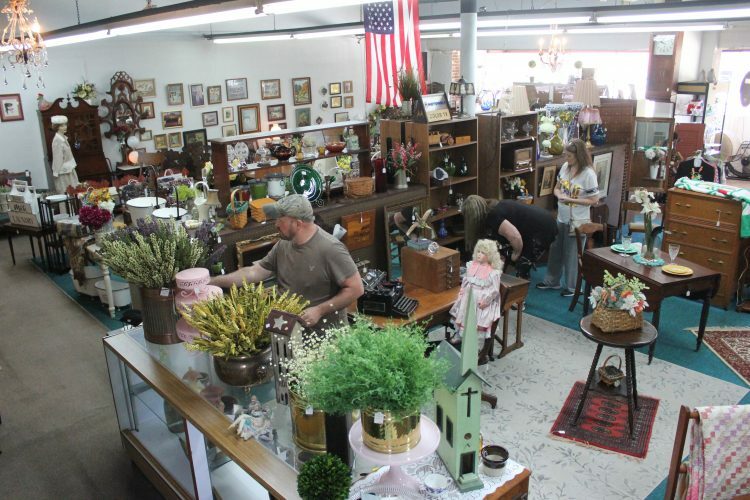 • 1950s and 1960s – Owned by Benjamin H. Putnam, Jr., and Mary H. Putnam. • 1967 – Sold to John and Mary Alice Oxaal. • 1968-84 – Owned by the Rosenblums. • 1984-92 – Owned by Alexander Schwaner. • 1992 – Purchased by Janet Gram. • 2005 – Purchased by Geoffrey Coward.